Friday, the 13th (nothing bad happened!) 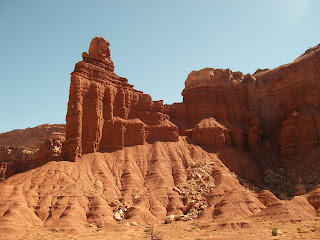 we left Torrey and rode into Capital Reef. 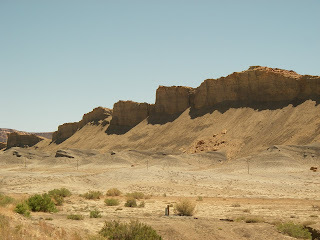 In Capital Reef National Park we passed through great red rock formations and the very pleasant Fruita District, an early Mormon settlement famous for its orchards along the Fremont River. The early settlers found ancient artifacts of the Fremont people including irrigation ditches thousands of years old. We took a short walk to view pictographs left by the Fremont people. It is humbling to think of these ancient people making their living in this harsh environment. We next passed through a very sere region of sparse vegetation and a predominantly grey color. Our friend John asked "What planet are we on now?". Indeed, we later learned that the locale was known as Luna Mesa. In the middle of this moonscape is Cainville. Don't blink or you'll miss it even on bikes. We pulled over for lunch at a very inviting patch of shady grass in front of the Cainville Cove Inn. We were just setting up to eat when Nancy, a blond mom of several youngsters and an abundance of energy and enthusiasm, came out to greet us and gave us two bunches of cold grapes to enjoy with our lunch (very welcome as the weather was quite warm). Nancy also made restrooms available to us, and later when we went to thank her for the hospitality she made us eat watermelon and gave each of us a pile of cookies to take with us. Again, the kindness of people like Nancy renew our faith in humanity. When you wonder at how they lived out there you have to marvel why, when they could have lived so many other places. Are the flats mainly caused by thorns etc. or unknown? John, howzit? A few of the flats by thorns, but most by tiny pieces of wire which I believe come from the steel belts of tires (mostly semi truck tires I think) that have disintegrated and have left shreds all over the roads everywhere. Blanding, UT. to Dolores, CO.